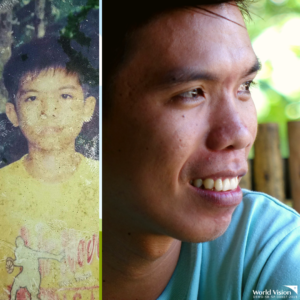 When asked about what moment in my childhood life I consider colorful and memorable, without thinking twice, it’s “WHEN I BECAME A SPONSORED CHILD OF WORLD VISION.” Indeed, World Vision has transformed so many lives of poor children. 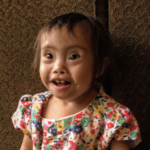 But, let me share you how World Vision has totally changed my life. My parents are both farmers. They have six children, including myself, the second among siblings. We live in the province of Surigao Del Norte where typhoons are the usual. I remember my parents would expect to harvest twenty sacks of rice, but due to heavy typhoons, they could only yield a few ‘cavans’. Needless to say, their meager salary, could barely cover our basic needs. Life was hard. It became a challenge for my parents to send us to school, but they believed that investing in education would give us a brighter future. I was four when my parents enrolled me in kindergarten. When I was five, I already walked my way to school, which was 2 kilometers away from our home. I walked a total of 8 kilometers a day since I had to get back to the house just to eat lunch because I didn’t feel like eating in school. Most of the time I was bullied and teased, because of my sticky, funny-looking hair. 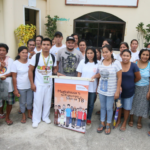 On my third grade, World Vision came to our community in partnership with Surigao Norte People’s Initiative Development Association (SNPIDA) and I gladly became a part of their child sponsorship program. With World Vision, schooling has been full of fun. As a kid, nothing compared to the joy I felt when I received new school supplies. It was absolutely indescribable! A poor little boy sporting brand new shoes, school uniform, and a school bag to boot. What a joy! Despite being bullied, I excelled in my classes. I developed the confidence to do well in my academics, and even in extra-curricular activities. I had the privilege to be the president of the Student Body Organization throughout the years. I became a consistent achiever in class and finished well, graduating valedictorian in both elementary and high school. After high school, World Vision continued to play a significant role in developing my potentials. It helped me broaden my horizon, exposing me to a lot of trainings and conferences not just locally, but even overseas. One of the most unforgettable experiences I had with World Vision was when as a child leader, I had the honor to represent our beloved country at United Nations (UN) General Assembly held at the UN Headquarters in New York City no less! If not because of World Vision, I doubt I would be the person that I am today. In 2011, I was listed as one of the Top 10 Most Inspiring Filipinos by the respected daily newspaper Manila Bulletin. After that good year, I was also nominated as one of the Top 10 Happiest Pinoy during the Nation-wide Search for The Happiest Pinoy, organized by Cebuana Lhuillier. With all the opportunities World Vision paved the way for me, I know there’s one person I should be grateful for the rest of my life – my Australian Sponsor. I always extended my gratitude to my sponsor through writing letters, especially during the Christmas season. For ten years, I wrote her a letter every year, and I always emphasized how she had become very instrumental in helping me become a better version of myself. I also shared to her almost all of the achievements I got in school trying to tell her that the help she gave was in never in vain. Her name is Amy Lurie. How can I forget her? I wish one day I could meet and thank her personally for her immense generosity. When I entered college, I passed the scholarship exam offered by the Department of Science and Technology (DOST), making me a government scholar, with monthly stipends to assist my college education. Whenever I see a poor child, I can’t help but look back and cherish the wonderful memories I had with WV. I can never skip thinking about my generous sponsor. I wonder how she felt all those years when she supported me. I wondered how it felt like to be a Child Sponsor myself. I prayed and desired to become a Child Sponsor one day after I finish college and start working. Paying forward Later after graduating from college in 2015, I took and passed the PRC Board Exam and became a licensed Electrical Engineer. I started working and had no reason to delay my desire to also give back to World Vision. When I celebrated my birthday last April 2018, I finally decided to pay it forward and sign up to sponsor a child through World Vision. What a joy to be blessed, and to bless others as well! Today, I do not only sponsor a child, but I also co-founded an advocacy initiative with my like-minded friends and groups, which we now call AiDucation for Underprivileged Children (AFUC). During one of our outreach in a poor community, I encountered a child named Brian who was forced to work, beg for food and money, and was alienated from his family. He became seriously ill, that I was moved to help him be reunited to his mother and siblings before he eventually died. Brian’s story became a tipping point for me to continue my personal advocacy which now helps at least 30 children, teaching them basic literacy/numeracy skills and values formation. World Vision helped changed my world and my vision in life. There’s nothing more fulfilling than being able to make a difference and be a life-changing gift for others.